News’ 75th Anniversary, each edition in 2014 will offer a specially commissioned feature article which examines a historical topic. Anniversary sponsors seen on pages 33 & 35. Guard allows delegation of authority to regional commanders to apply resources to the highest needs. And as long as that continues to be the operational doctrine of the Coast Guard, then the American public can have the confi dence that whatever the funding levels allocated, those resources will be applied accord- ing to the current set of risks. Now, that may, from time to time, be emphasizing one set of authorities or jurisdictions over another. In my view, the service has done that very well. 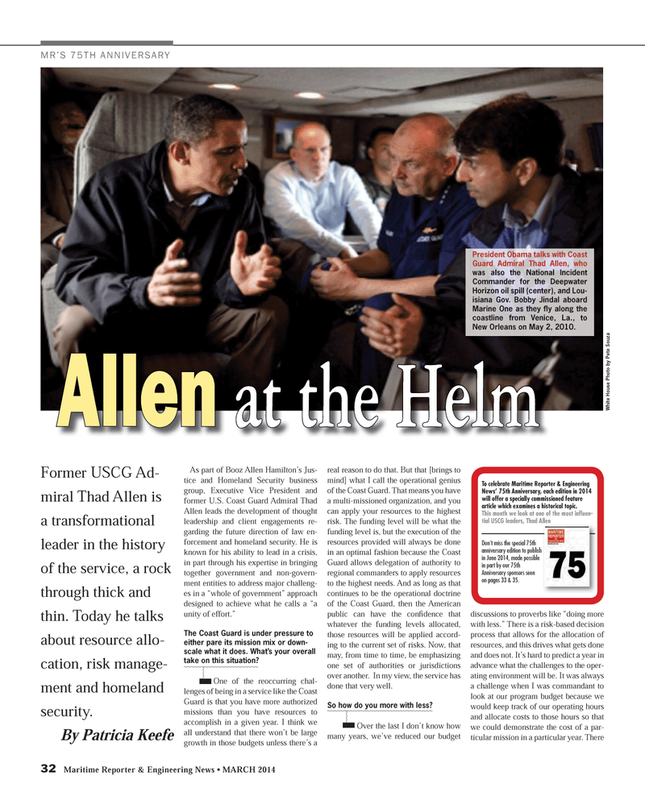 Former USCG Ad- miral Thad Allen is a transformational leader in the history of the service, a rock through thick and thin. Today he talks about resource allo- cation, risk manage- ment and homeland security. New Orleans on May 2, 2010.